Thanks to the Under-14 teams of Lytham Junior Blues and Thornton Cleveleys Whites for stepping in as our match of the week and providing a thrilling Hogan Cup first-round tie. Unfortunately our photographer was unable to attend our intended feature match, but the Blues and Whites staged a spectacular contest as the Blues recovered from three goals down at half-time to draw level only to lose out on penalties. Talk about a game of two halves as the Thornton side controlled the first half to storm into a three-goal lead. Jake Evans sped through to open the scoring before a cross reached George Wincott, who fired in a half-volley. The Whites’ third was the most spectacular,a 30-yard strike into the top corner by Joe Smalley. His manager Garry Ray said: “Joe had said before kick-off that he was going to score from halfway and he almost did.” But after a productive half-time discussion, the Blues were a different side in the second half and forced their way back into the contest, inspired by two goals by left winger Kane Twomey. Kane began the comeback with a cracking drive into the top corner from 20 yards, then doubled his and his side’s tally with a back-post header from a free-kick. 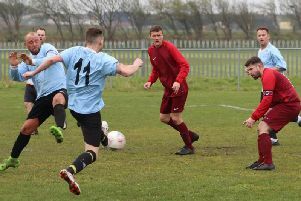 Before long Kai Hallam made it 3-3 and both sides had chances to win it in normal time and avoid the dreaded shoot-out. Both keepers made fine saves as penalties reached 2-2 after five apiece, meaning sudden death. And it was an excellent save by Thornton’s Chris Ray which sealed their 3-2 spot-kick win. Keeper Ray may be nicknamed ‘Kipper’ but he resembled a leaping salmon as he threw himself full-length to his left to get a strong hand to the final spot-kick and turn it around the post. The Whites’ reward is a second-round tie against unbeaten league leaders Squires Gate, while the Blues will have a further chance of knockout success in the plate. The Plate will add to a very busy schedule for the Blues, who still have to accommodate nine league fixtures. It will be a tall order for Garry Ray’s Whites in the next round but he said: “The lads love playing in the knockout games and this was a brilliant match. Two-goal Twomey was Lytham’s player of the match, a constant threat down the flank.